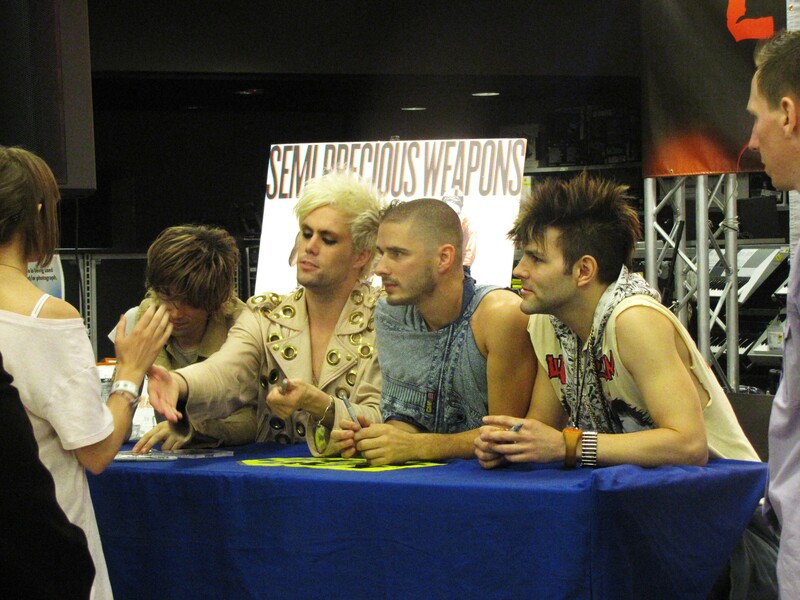 Let me tell you something about Semi Precious Weapons. They are something. Not long ago, during the summer of 2008, I was given their first album, We Love You by an acquaintance at the band’s previous label. I instantly fell in love with the band’s unhinged rock ‘n roll spirit, fierce guitar solos, aggressive drumming, and Justin Tranter’s Broadway-esque vocal range and sexually charged lyrics. It was decided; I needed to see these guys live, and it just so happened they were playing the House of Blues in Hollywood that week. On stage, the quartet was one attractive, energetic, and wild machine. Tranter’s high heeled boots, platinum hair, fishnets, and burlesque presence dazzled (they still do), as Cole Whittle rolled around on the floor, seizured, and shouted, all while playing the bass, Dan Crean slammed down on his drumkit with fiery force, and (previous) guitarist Aaron Tasjan handled the hair-metal guitar solos with ease. To say the least, I was shocked, amazed, and addicted. Off-stage, the guys were kind-hearted, gentlemanly, and gregarious, and because CMJ was not too far off, we agreed to meet in the fall, in their home city, New York. My first day of my first ever CMJ arrived, and it was like Christmas morning, except it was early afternoon and I was receiving a badge that I had paid for myself. While in line to pick up said plastic, THE Justin Tranter strutted by in full regalia and sweetly pecked me on the cheek, charmingly greeted me, “Hey baby!” Later on, at my first panel, Tranter again appeared, this time as a member of the panel, and we waved at each other enthusiastically. The evening came, and one of my first destinations was the launch of Tranter’s jewely line, Fetty, at Barney’s New York. Upscale and full of press, Tranter did not overlook any lady, proudly clasping necklaces and bracelets on guests. Crean made time to make the rounds and see friends and fans. Witnessing the band in action, I knew I had found a group of special people. Always on the go, the SPW boys performed close to midnight at Arlene’s Grocery where they reaffirmed my initial reactions. Their new guitarist, Stevy Pyne bounced and flailed around the stage, unleashed effortless, outrageous solos, and like the rest of the band, looked good doing it. Friday of CMJ, I attended the Perez Hilton Showcase for the purpose of seeing SPW play for one of their biggest supporters. However, also on the bill, was Lady Gaga; little did I know what degree of super stardom lay in her future. The lowdown on CMJ 2008 can be found here. Two months later, I returned from LA to NY to follow up with some of the best of the best of CMJ 2008. I was lucky to grab a phone interview with Justin while he was in the midst of making a peanut butter and jelly sandwich in his Brooklyn home. Gracious and quick-witted, he offered some memorable responses, and even more impressive, he gathered up the answers from his bandmates which they sent that evening. Check out the interview here on All Access Magazine. In the coming year, although in California, I kept tabs on the glamorous Brooklynites and saw them when they came through LA and several times at SXSW in Austin, photographed Fetty pieces at Urban Outfitters, watched as Lady Gaga became a pop icon, and jumped for joy with the news that she had picked Semi Precious Weapons as her supporting act for her currently ongoing Monster Ball Tour. This summer, after failing to get Gaga tickets for the sold out shows at Madison Square Garden, I made sure I cleared my evening for an “afterparty” at Hudson Hotel, where I felt like I had reunited with my long lost family. to close the week, I scurried to Best Buy at Union Square for an in-store performance and for one last so-long before SPW returned to tour, and to confirm an email interview I wanted to send them while they were on the road. Of course they said, “We’d be glad to.” Read it! That brings me to today. After receiving umteen Tweets about the new video for “Look at Me,”a track from their latest record You Love You, I thought it might be time to make note of it here on Rocker Stalker. Enjoy the filth and glamour! Semi Precious Weapons are currently on the US leg of their Dirty Showbiz Tour and will be stopping by to headline New York’s Irving Plaza on OCTOBER 8! Get your tickets!